Mom and Me was created to foster the relationship of moms and kids through various activities that they can do together. With our busy lifestyle, it becomes a challenge for us to spend as much time with the kids as we would want to. The weekend is a breeze and often times, we resort to the TV or the mall for quality time. Mom and Me, along with its partner companies, feature all the many activities that you can do together such as arts and crafts, singing, dancing, sports, cooking, and more! These are activities you may not have initially thought of. You might have enjoyed doing them back when you were still flaunting a 24-inch waist line. Or you might have wanted to do them but just couldn’t get around to it. Happy mom, happy family, so they say. And what else makes a happy mom more than spending time with their adorable bundles of joy! Mom and Me wants YOU to bring out your active, fun-loving, super-mom selves. Discover new places, get to know your kids’ interests, and meet new friends. Shared activities allow both you and your child to have a common experience and goal, strengthening your relationship further. These are the memories that we, and our children will look back on and the moments that will define our family. Mom and Me is a lifestyle event brand of MARS Ideas Inc. 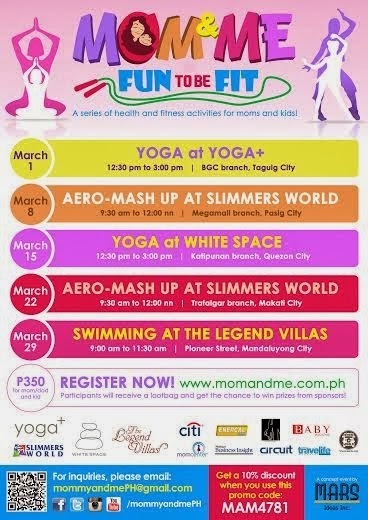 This March, Mom and Me presents its new event series, Fun To Be Fit. Get physical with popular fitness activities such as yoga, aero-mashup and swimming. Each Saturday of the month of March features one activity you and the kids will surely enjoy! There's more! They're giving away tickets here! (Note: This Rafflecopter is one and the same as from their website. If you have already joined there, that's it. If not, then you can join through here.) 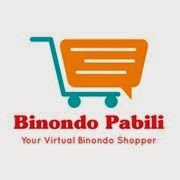 And as a favor, hope you could also like The Binondo Mommy's FB page but that's optional and not part of the mechanics. A total of 5 tickets will be given away, one for each event day. 1. Contest is open from February 17 to March 28, 2014.